The awesome Fiiish Black Minnow!!! The main packs come in 6 different sizes with one jig head and two bodies. These are the spare bodies, 3 bodies per pack in 7 different colours as listed on the drop down above. This lure has proven deadly for all predatory game but most of all is an ultimate Bass lure worked on a retrive or with any sinking/drawing method. 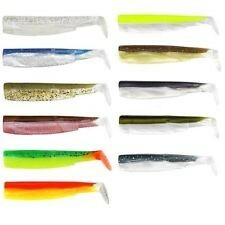 FREE Delivery on all Fiiish Sea Fishing Shads and Soft Baits over £100!! !